When I came to the US nearly twenty years ago, one of the many differences I noticed was the lack in the US of any system to make sure that the standards of undergraduate and masters level degrees were approximately uniform across institutions. In the UK each degree course was obliged to appoint a suitably experienced teacher from another university, hence the term “external examiner.” Their job was to ensure that student assessments are comprehensive and fair. At the minimum this means running any form of assessment by the external examiner, who can then ask to see any of the exams or projects that make up the assessment. Before I came to the US, I did a fair bit of external examining. For medical students it usually meant spending a couple of days at that university taking part in anatomy vivas. For science courses being an external examiner meant reading research projects and then quizzing students to see how much of what they wrote they understood! I have vivid memories of being the external examiner at St. Bartholomew’s Hospital Medical College when O.J. Lewis was the Professor. The anatomy vivas took three days, and for me it was a delight to spend that time with “OJ”. It was when Smithfield was still a functioning meat market, and we used to go for lunch to a restaurant in the basement of the market where we consumed gargantuan steaks. During one such visit as an external examiner to an old-style anatomy department I learned that as part of its “modernization” the departmental reprint collection had been assigned to a dumpster. I knew that a previous professor had been interested in physical anthropology, so during the lunch-break I went dumpster-diving to see if there were any interesting reprints that could be rescued. This was still at a time when researchers relied on reprints to help them keep up-to-date with the literature in their field. Among the treasures I rescued that day was a signed copy of Raymond Dart’s 1925 letter to Nature, which is now in a frame on my office wall. 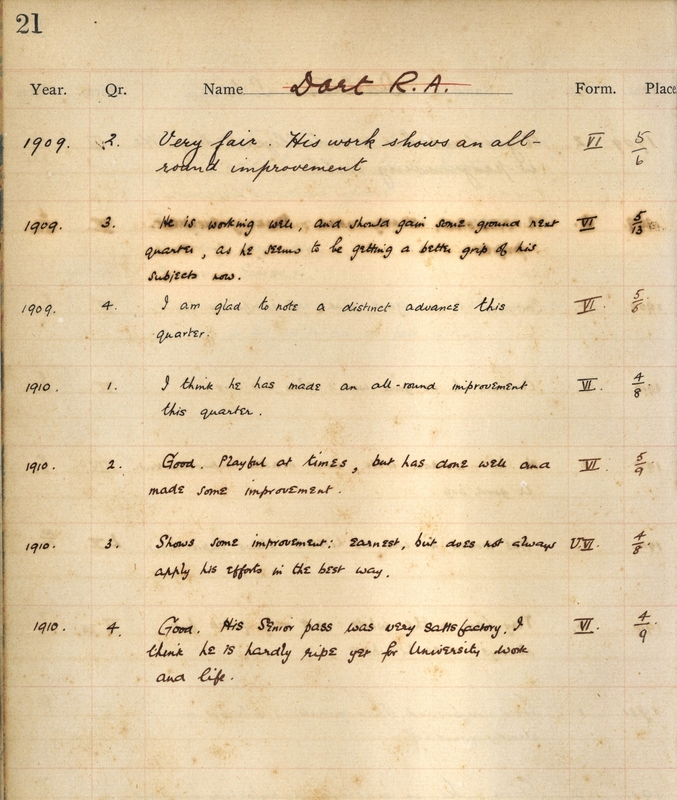 Reprint of Raymond Dart’s 1925 letter to Nature signed by the author. Raymond Dart was born in 1893 in Toowong, a suburb of Brisbane, Australia. He went to school nearby at Ipswich Grammar School, and despite discouraging assessments by his teachers he did well enough to enter the University of Queensland in 1911 to study for a Bachelor of Science degree. Dart was raised in a religiously fundamentalist family, and perhaps because of this he became interested in evolutionary theory. However, after graduating in 1914 he moved to the University of Sydney to study medicine. Dart completed his medical degree in 1917, after which he enlisted in the Australian Army Medical Corps, spending the final year of WWI in France. After his demobilization in 1919, Dart studied for a year with fellow Australian Grafton Elliot Smith in the Anatomy Department at University College London, then he spent a year working with Robert J. Terry at Washington University in St. Louis. In 1922, despite his young age he applied for the Chair of Anatomy at the recently established University of the Witwatersrand in Johannesburg, South Africa, and he was successful. 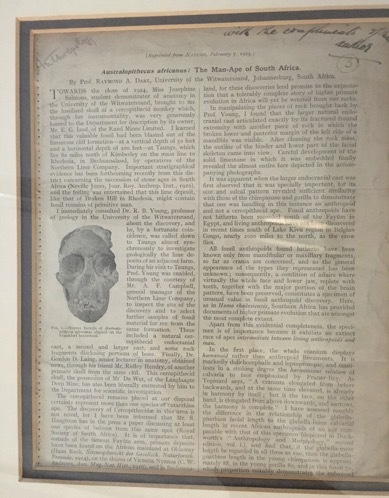 Early in 1924 Josephine Salmons, a medical student at the University of the Witwatersrand, brought Dart a fossil baboon skull that had been blasted out of the Northern Lime Company's quarry located near the town of Taungs1, and Dart arranged for any other interesting fossils to be sent to him. In November 1924 he received a crate of fossils from the quarry that included a natural endocranial cast (the fossilized cast of a brain) and the anterior portion of a cranium and a lower jaw. After 4 weeks of preparation Dart freed the face from the surrounding breccia, revealing the partial skull of a juvenile primate that was not baboon-like. Dart judged that many anatomical features of the skull and endocranial cast were modern human-like and from the position of the foramen magnum he concluded that the creature was bipedal. There were, however, also ape-like features to the skull, notably its small cranial capacity. Dart published a brief description of the fossil in Nature in February 1925. In that short letter he described its anatomy, the geological evidence for its antiquity and his reasons for interpreting it as evidence of a “man-like ape” that might be ancestral to modern humans. To reflect his interpretation, Dart named the specimen Australopithecus africanus, meaning the “southern ape from Africa.” Eugène Dubois‘ discovery of Pithecanthropus erectus in Java in the 1890s, and the later discoveries of Sinanthropus pekinensis (both species are now classified as Homo erectus) in China during the 1920s and 1930s seemed to support Ernst Haeckel's idea that modern humans had evolved in Asia, so few anthropologists were expecting fossil evidence of the early stages of human evolution in Africa. There were other reasons for scientists to be doubtful about Dart's interpretation of Australopithecus, for the small-brained but upright Pithecanthropus seemed to support the view that bipedalism had freed the hands to make and use tools, that then led to an increase in the size of the brain. However, other researchers believed that a large brain had evolved first with bipedalism coming later, and the controversial discoveries at Piltdown of Eoanthropus dawsonii seemed to support this view. Thus, while most prominent physical anthropologists (e.g., Grafton Elliot Smith and Arthur Keith) were skeptical about Dart's claim that Au. 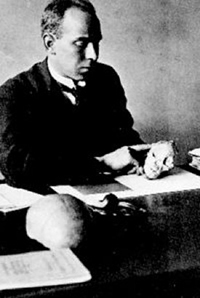 africanus represented an intermediate form between the anthropoid apes and modern humans, Dart did gain one important supporter, the Scottish-born paleontologist Robert Broom, who agreed that the what is now known as the “Taung child” represented a species that was intermediate between apes and modern humans. Dart worked and published on Au. africanus only sporadically during the 1920s and 1930s, and then the exigencies of WWII meant that paleoanthropological research in South Africa took a back seat. In 1947 Raymond Dart was thrust back into paleoanthropology when James Kitching found a portion of an Australopithecus cranium along with a large quantity of animal fossils at a limestone quarry at Makapansgat in the former central Transvaal, now Limpopo Province. The new fossil and the abundance of animal remains assumed a new significance when Kitching found fossil baboon skulls that he suggested had been fractured in a way that was consistent with them being struck by a club. Dart concluded from the material recovered at Makapansgat that the australopiths had hunted big game animals thus explaining the vast quantities of ungulate bones, but more significantly Dart argued that there was evidence that some of those ungulate bones had been modified or used as tools. He argued the evidence at Makapansgat was consistent with what he called an osteodontokeratic (i.e., bone/tooth/horn) industry that he suggested antedated the use of stone to make tools. Between 1949 and the mid-1960s Dart studied and published extensively on the osteodontokeratic culture, but his interpretation has subsequently been rejected in favor of less exotic explanations for the patterns of breakage2. 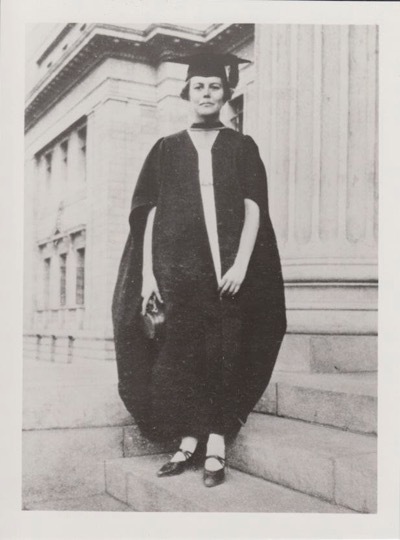 Dart, who retired from the University of the Witwatersrand in 1958, continued to conduct research into the 1960s. He died in 1988. Griffith University has recently instituted a Raymond Dart Lecture. I was honored and delighted to deliver the first lecture in the series not long ago, especially so because Dart’s great niece and teachers from his old school, Ipswich Grammar, were in the audience. 2See the seminal book by C.K. (Bob) Brain (1981) The Hunters or the Hunted? An Introduction to African Cave Taphonomy. University of Chicago Press, Chicago, IL.